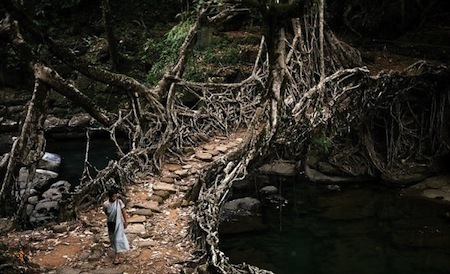 These living bridges are created by the people of Nongriat in Meghalaya, India. 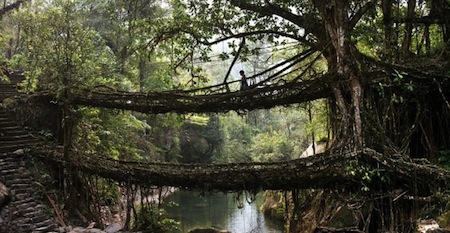 Some are one hundred feet in length, and support up to fifty people at a time; others are double-decker bridges! The locals’ answer lie in the sloping hills hugging the contour of the water channels, where a species of rubber tree flourishes. From the upper trunk of the ficus elastica, secondary roots grow outwards with great profuseness. The tribes people realized half a millenia ago that they could use these roots to forge a pass across the water below, using hollowed out betel nut trunks to guide the direction of the roots’ growth. Once the roots make their way across the water to the opposite bank, they take hold. Here, they continue to grow and strengthen, not only stabilizing the bridge platform, but also reinforcing the bank walls. The full cycle of bridge-growing may take ten to fifteen years to complete, necessitating the locals’ aboricultural knowledge to be passed on from older to younger generations, who will, perhaps, personally continue the former’s work. Farr lowered himself upon one of the frail magenta bladders. The smooth skin stretched and fitted itself to his body.